1Précurseur, dès les années 1970, de l’histoire sociale états-unienne du Moyen Âge, Lester K. Little a accepté de revenir sur ses travaux et sur son expérience d’historien médiéviste dans cet entretien réalisé entre août 2012 et avril 2013. L’intégralité de ces échanges par écrit est publiée ici dans son expression bilingue originale. 2Eliana Magnani : Vos premiers travaux – je pense en particulier à votre article « Pride Goes Before Avarice… » (1971), qui annonce déjà votre premier livre Religious poverty and the profit economy… (1978) – vous situent comme l’un des pionniers de l’histoire sociale états-unienne du Moyen Âge. Comment caractériseriez-vous aujourd’hui vos premiers travaux et leur réception ? 3Lester K. Little : Over many years of teaching I have shied away from stating, or even trying to formulate, what I hold to be fundamental principles of history, preferring to let my views emerge from the ways I deal with historical issues in the course of lecturing and writing or of discussing with students. Yet once as I walked through a major retrospective show of the works of Giorgio Morandi, a painter who steadfastly refused to engage in public discussions of his art, I was jolted into jotting down these sentences quoted from one of his letters on an exhibition panel: “I believe that nothing can be more abstract, more unreal, than what we actually see. Matter exists, of course, but has no intrinsic meaning of its own, such as the meaning that we attach to it”. To this I immediately added: “So it is with the countless bits of information about the past thus far available to us”. 4Allow me to start with a few remarks concerning when and how I developed an interest in history. Only upon leaving the reassuring certainties of family and home community at age seventeen to study for my bachelor’s degree did I become aware of questions that disturbed me. I felt a strong need to know how and why the many different sorts of people I was meeting for the first time were as they were and thought and acted as they did. Inevitably just as strong was my need to ask the same questions about myself. The issue was of course identity but at the time I did not possess that particular frame of reference. Answers flooded in from all the areas I studied at first, whether English or French literature, zoology, mathematics, or history of architecture. But the most consistently illuminating answers, answers that were not just convincing but, to state matters as plainly as I can, the most compatible with the way I think and thus the most satisfying, came from studying history. For me this did not at all signify a desire to gather up vast amounts of information about the past, but rather a desire to get answers to my questions about how the world got to be as I was coming to know it. 5Although I studied a great deal of American history I was much more drawn to the grand drama of the history of “Western Civilization”, so much in vogue in American universities following the war that had thrust the United States into a leading role in world affairs. My initial enthusiasm carried me far, since it encouraged me to specialize in European history for my bachelor’s degree and to continue doing so in post-graduate studies. In graduate school, however, first at the University of Chicago and then at Princeton, the excellent training I got from several gifted historians was uniformly in the mold of late nineteenth-century German positivist, “scientific” history. None of the direction I received led me to see how I could deal with matters of the sort that had made me enthusiastic about history in the first place. While still an undergraduate I had read Max Weber’s The Protestant Ethic and the Spirit of Capitalism, which told me more about my Protestant upbringing in New England than anything else I had been reading, but in graduate school the various disciplines and sub-disciplines were so strictly segregated that a novice was supposed to work on a topic (a) limited to a relatively short time period, (b) confined within a small territorial area, and (c) based on one particular type of source. Economic history dealt with prices and commercial contracts, intellectual history with ideas, political history with charters and tax rolls, and so on. Images belonged to art historians, whose interest in them was mainly limited to elucidating their iconographic significance and genealogical heritage. For example, a twelfth-century Italian image could be dismissed as insignificant once a scholar could show that it was based on an eighth-century Byzantine prototype. Religious history was, to be frank, not about religion at all but little more than church history, which in turn tended to be either political or institutional. Literature? That was fiction, clearly not the stuff of history. Miracle stories were fairy tales. In sum, nowhere in the United states in the late 1950s and early 60s was there anything happening in medieval history, at least that I was aware of, that gave me encouragement to pursue my intuitions about history. On my part the problem was that I did not know how to define what I was looking for. 6Fortunately I had spent one of my undergraduate years in Paris because it was by returning there in the early 60s as a doctorandus that I was privileged to meet both Marie-Dominique Chenu and Jacques Le Goff. For all the distinctions between these men, one inescapable and attractive trait they shared was that they were rebels against the prevailing orthodoxies of their respective environments. The rebelliousness of both, moreover, was remarkably restrained and tactful. Père Chenu wove social change seamlessly into the way he presented the history of theology as well as the history of different forms of religious life (referred to at the time clumsily as “spirituality”). The bewildering array of such forms that I had been studying became, through the lens of his writings, coherent and explicable. Before publishing anything of my own based on these insights I worked with a colleague to translate La théologie au douzième siècle into English 1. After Giles Constable gave it the most meticulous critical reading any author or translator could wish for, the University of Chicago Press published it in 1968. It became basic reading for students of the leading scholars and teachers of medieval religious life, beginning with Constable himself of course and his disciple Caroline Bynum. 7Instead of observing the norm of producing a massive thèse d’état, Jacques Le Goff started off his career by publishing two small books on particular social groups, merchants and bankers in one case, intellectuals in the other, and then a large general survey of medieval civilization that included many maps and charts plus some one hundred forty photographs 2. The form of this book was one normally reserved for works of popularization, but its substance was stunningly original. The usually separate strands of political, economic, social, etc. history were here woven together. Besides, the crucial component was one that had no status as a “field” of history but that in fact informed all of them, namely the history of mentalities. His frequent references to common ways of thinking and feeling, also of attitudes, suggest to speakers of English phrases that describe such culturally formed behavior as habits of mind or second nature. The final chapter itself was called “Mentalities, Sensibilities, and Attitudes”. And though photographs had obviously been used before, but almost exclusively as “illustrations”, M. Le Goff was using these images as historical documents; they were not extras added on to his text but integral components of his arguments. Each of these aspects of his work had a direct impact on my early publications. 8Meanwhile in the early part of the 1960s, developments entirely separate from my personal experience but relevant to it were taking place. First of all, The New York Review of Books began publication in 1963. To limit my observations to its impact on just history, this marked for the very first time in the States serious public discussion of major issues in historical problems and methods. The reviews were several times longer than the norm for academic journals and were often not written by experts in the particular field of the book under review (a policy sometimes advantageous, sometimes not). Professional historians still found useful the reviews in the Times Literary Supplement, but the latter now seemed to be tame and more exclusively directed to an academic audience in comparison with this American newcomer. The second notable innovation of the years 1964-1965 was the appointment of Lawrence Stone to the seventeenth-century position at Princeton. [I had left Princeton in 1963 so this development had no direct importance for me.] Rarely does the appointment of one individual lead to such a thorough overhaul of an entire department in such a short time. Stone got the department to institute a methods course required of all history graduate students. Each of the weekly seminars was devoted to a different approach to historical research: anthropological, economic, psychological, computer-generated, etc. The students did massive amounts of reading in preparation for each session. The invited seminar leader for each week was either a specialist in the allied discipline under discussion or else a historian who had already experimented with it in an interdisciplinary approach. With the passage of each year it became easier to find such historians. Stone also arranged to have one historian from the EHESS come to Princeton each year as a visiting professor. The next new regular appointment in the Princeton department was of Natalie Davis. Stone and Davis, as well as Robert Darnton, the department’s specialist in eighteenth-century French history, became frequent contributors to the N. Y. Review. In this way the works of the French social historians, starting with Fernand Braudel, but also those of the Italian historian Carlo Ginzburg, became well known and profoundly influential in America. 9In the late 1960s, as the main lines of what became the religious poverty book were taking shape in my mind, I hit upon the sin of avarice as a key to getting at changing attitudes or ways of thinking about money, and started collecting both texts and images of avarice. Hitherto the study of the virtues and vices belonged nearly exclusively in the province of Ideengeschichte, exemplified in the works of Morton W. Bloomfield, whereas the illustrations of Prudentius’ poem on the battle between the virtues and the vices belonged to that of Kunstgeschichte, seen for example in the work of Adolf Katzenellenbogen 3. Because this investigation of the vice of avarice had gone as far as I needed or wished to take it, but the book on poverty was still only partially written, I decided to try to publish it separately as an article. It never occurred to me to include photographs with the paper because I wanted them for the book and anyway no historical journal I knew of published photos. Art history journals did but I had no interest in trying to traverse that disciplinary boundary line. Therefore in 1969 I submitted a version of the essay to the American Historical Review with no photographs but in their stead descriptions in plain prose of each of the statues or manuscript illuminations that I was using for evidence. In due course I received the editor’s favorable response, which of course delighted me. What I could not have anticipated, though, was that in addition he revealed to me his plan to change the format and design of the journal for the first time since its founding in 1895, a change that was to make possible the inclusion of images. The happy result was that I worked closely with both the editor and the designer in preparing “Pride Goes before Avarice” for publication in the first issue of the new format (February 1971), with the personification of superbia as a falling rider from the façade of Chartres on the front cover (fig. 2). 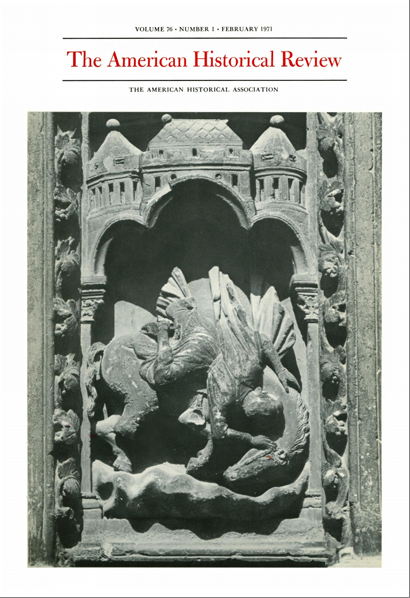 10When I presented the material of that article, with images, at a large gathering of medievalists in Paris in the winter of 1970-71, Père Chenu was present. It was probably because he was perceived as the doyen of all those present that he was asked by the person presiding to make the first comment. Even so, the way he was asked to speak (“Let’s hear what the historian of theology has to say”) made me think that the question was more an invitation to be critical of the approach I had taken. Chenu, though, said that he found the argument convincing and added a comment to the effect, in case any should doubt where he stood, that dogmatic theology stands up well through history, but –here he hesitated for a moment to glance around the room as if, I thought, he were wondering whether he should say what he was going to say in the words that came to his mind–moral theology merely reflects society; it can’t do or be otherwise. 11Also at the start of the new decade Barbara H. Rosenwein, then a graduate student in medieval history at the University of Chicago, and I collaborated on our parallel arguments concerning the social significance of different forms of religious life, hers concerning the monks and mine the friars. That article appeared in Past and Present in 1974. 12While the anonymous readers for both the AHR and Past and Present articles were very favorably disposed toward the articles that I and then we sent to those journals, getting the religious poverty book published was a long-suffering travail. Since Chicago had published the Chenu book I thought it the obvious place to send the book manuscript. It took over a year to get the reply, which in the end was negative. The first anonymous reader recommended against publication without writing a lengthy report but by saying that the work had nothing new to say and was not well written. The second reader took great pains to write a ten-page critique that included many specific comments on both style and argument. He or she insisted that the text had to be cut by one-third, or preferably one-half, and concluded that Chicago should publish it only if I made all of the recommended changes. The press sought a third opinion, which would have had to be highly favorable in order to bring about a positive decision. The result was just the opposite, as well as most revealing. The third report displayed open hostility and arrogance. It asked whether the University of Chicago Press had changed its policy of publishing books of scholarly merit; otherwise why were they wasting their time (and presumably the reader’s) with something no better than a textbook. Every sub-section of every chapter was declared to contain nothing new. That was alright with me, except that the reader failed to denounce, or even mention, the thesis or argument, the very structure and purpose of the book. 13I took the second reader’s critique seriously and spent nearly a year re-writing, and shortening, the book, and then sent it to Oxford. The editor replied in a timely fashion, said he liked it but that the press had far more publishable books in line than they could possibly publish, and then asked whether I would mind if he were to send the manuscript on to a commercial publisher in London. I suspected that contact had already been made because I of course agreed and within a few weeks Paul Elek of London had offered me a contract. “By a quirk of publishing or historiography nearly all of the books noticed here are either on medieval religion or medieval economics. The contrast is not, however, so sharp as it might first appear, for three of the books attempt or contain attempts to establish a convergence between the two areas. One of those three, the book by L. K. Little, attempts to prove a specific thesis, that the rise of a profit economy brought the rise of the friars. Indeed the division between what may be called substantive history and interpretative history is in some ways more profound than between different kinds of substantive history; although all history involves interpretation, writing to a thesis rather than allowing an interpretation to emerge through a full consideration of every sort of evidence represents another approach. In recent years there has been a growing tendency towards interpretation and it is maintained in the present selection. Of these ten books only three can be considered substantive histories”. 15Each of the three “substantive” histories –devoted to The Popes and the Papacy in the Early Middle Ages, The English Church, 1066-1154, and coinage in France, Aragon, and Catalonia– was, in Leff’s judgment, likely to become a standard work. I have always learned from and appreciated “substantive” and “standard” works; without them I could not do the work that I do. On the other hand I don’t go about claiming the superiority of “interpretative” over “substantive” books. 16The only version of Religious Poverty published in a foreign language was in Spanish 4. An Italian publisher purchased the rights to do a translation but never followed through. The one West German review of the book I recall was brief and dismissive, whereas in the East Ernst Werner and some of his colleagues at Leipzig and elsewhere were very receptive. These differing perceptions do not line up according to some imagined Cold-War divide. Not long after the book appeared I received an invitation from a priest in Rome, Giancarlo Rocca, the editor of the Dizionario degli Istituti di Perfezione, to contribute an entry titled “La povertà degli ordini in una nuova epoca commercial (1000-1300)”. This was to be one of a dozen or more sub-topics under the general heading of Poverty. I never met Padre Rocca but some years later I did happen to meet Dom Jean Gribomont, whose roles in the dictionary included shared responsibility with his confrère Dom Jean Leclercq for “General questions on the religious life”, full responsibility for the entries on eastern monasticism, and organization of the entire section on poverty, including the introductory essay on that topic. At the time we met, which was in the Vatican Library, I was working on liturgical maledictions, and he took particular interest in what I had to say about the clamor ad deum, indeed any clamors on the part of aggrieved persons to higher authorities. After a moment’s reflection he said that all the effort that went into the producing their ten-volume Dizionario could be considered “one large clamor to whoever might be listening up there”, pointing not straight up into the sky but precisely in the direction of the papal palace. 17Overall the reaction to Religious Poverty in the United States seemed to me favorable, although judgments about its reception and influence would be better left to others. What I am in a position to say is that colleagues have told me over the years, and still do after more than thirty years, that the thesis engages the interest of their students. They invariably report that students can agree or disagree with all or parts of the thesis but they cannot ignore it; they cannot claim simply to have imbibed some information (or substance!) without having to tangle with a thesis. Thus I’m persuaded of its pedagogical success. 18The main point, however, is that very shortly after I completed my graduate study and began to find my own way the historiographical situation as it affected social history started to change dramatically and rapidly. By the end of the 70s that situation was of course far more welcoming than it had been two decades earlier. That the approaches to historical scholarship that prevailed in the post-war period were essentially a continuation of those from the two inter-war decades should not be surprising. Most of the more active scholars from the 30s suspended their work for service in the war effort, some of the younger ones in combat, many of all ages, men and women alike, in intelligence. Of course they were anxious to pick up their careers in 1945-1946 where they had left off. But there was more than mere continuity. There was an important new factor, innovative in some ways, but strongly reinforcing of tradition in other ways. The influx of intellectual émigrés brought cultural riches of inestimable value to the United States. One has only think of music and physics and psychoanalysis and so many other fields to get a sense of this collateral treasure that resulted from the catastrophe of that war. But when we look more closely at the particular humanistic and social scientific disciplines, we see first an overwhelming predominance of Germans and central Europeans. Secondly, we see the almost inconceivable erudition of individuals such as Ernst Kantorowicz or Felix Gilbert or Theodore Mommsen or Hans Baron or Gerhardt Ladner or Erwin Panofsky or… the list could be so long… and of how they enriched our knowledge of ideas and images and political thought and the classical heritage and so much more. Similar lists of the great and gifted could be cited for each of the social sciences. Yet here is the point. There is virtually no overlap between these lists of historians and of social scientists. They lived in separate universes, universes that were inventive and that stimulated the post-war generations of American students, but especially as far as history was concerned did nothing to change the rigidity of the methodologies developed in German historical seminars in the 1880s, the very milieux frequented by America’s first generation of professional historians. 19In a milieu I happened to know well, the University of Chicago, Bruno Bettelheim was teaching psychology at the same time, 1958-1959, that my interest in history came close to being suffocated by the barons of the History Department. In fact the president of the American Historical Association, a modern European historian at Harvard named William Langer, addressed that organization he headed in December 1958 on the need to integrate psychology into the historians’ craft, but the senior historians at Chicago had nothing good to say about Langer’s address. In fact just a few months later they voted to fire a young professor of early American history, Stanley Elkins, who used Bettelheim’s theory, drawn from the Nazi experience, of the techniques employed by oppressive regimes to reduce their subjects to an infantilized state, in order to explore the “Sambo” comportment of slaves. Elkins’ book won much praise, several prizes, and abundant opposition. 20To return to the matter of the intellectual migration of the 1930s-1940s, I believe it relevant to signal the relatively low number, absence nearly, of French émigrés. The saddest part of this reflection is to think of how close the emigration of Marc Bloch and his family came to being realized, there being already in place a professorship at the New School for Social Research in New York awaiting him. But even if he had made the trip safely, since we are speculating on what might have happened we have to factor in the reality that few of the already few French émigrés remained in the States longer than they had to. The plain cultural truth is that they preferred to return home, so that perhaps even a brief American sojourn by Bloch might not have sufficed to shake up history’s status quo. In any case the integration of the social sciences into historical scholarship and interdisciplinarity generally failed to make headway in the United States in the 1950s, did get started in the 60s and was becoming mainstream by the late 1970s. 21EM : Vous placez l’émergence de votre travail d’historien médiéviste dans un contexte – politique, culturel et intellectuel des États-Unis des années 1960-1970 – qui vous permet de sortir du cadre, qui vous semble étriqué, de l’histoire méthodique, et vous conduit vers d’autres disciplines et vers des échanges avec des courants alors en développement en Europe, en France, autour des noms comme ceux du père Marie-Dominique Chenu (1895-1990) ou de Jacques Le Goff. Je rappellerai aussi, pour ajouter une note à la réception de vos premiers travaux, qu’en France, votre livre Religious Poverty and the Profit Economy in Medieval Europe (1978) a été recensé dans les Annales ESC (1979, par Jean-Claude Schmitt) et dans les Archives de sciences sociales des religions (1981, par Jacqueline Guiral), ce qui situe bien les milieux ouverts alors à accueillir un livre « à thèse » que le recenseur du Times Literary Supplement (Gordon Leff) vous reprochait. 22Justement, j’aimerais revenir sur un point de la thèse que vous défendez dans ce travail. En fait, vous mettez en relation, entre autres, les différents ordres religieux – bénédictins, chanoines réguliers, franciscains, dominicains… –, le développement de la société urbaine et le passage de l’économie de l’échange (du troc) à l’économie du profit. Vous entendez montrer la corrélation entre l’économie monétaire, la société urbaine et une spiritualité, celle des ordres mendiants, fondée sur la pauvreté, qui, paradoxalement, ferait « système » avec l’activité marchande. – Comme vous venez de rappeler, le Père Chenu avait admis, en vous écoutant, que la théologie « morale » ne peut être que le reflet de la société, ce qui semble aller de soi aujourd’hui, mais qui était une nouveauté à l’époque ! Vous vous basez, entre autres, sur la chronologie du « deuxième âge féodal » de Marc Bloch (1886-1944) et sur l’abstraction d’une « révolution commerciale » que Roberto Sabatino Lopez (1910-1986) avait dégagée par analogie avec la « révolution industrielle » pour rendre compte de la société « préindustrielle », de même que sur la théorie du don-échange (gift-exchange), d’après les formulations célèbres de Marcel Mauss (1872-1950). Ne pensez-vous pas que cette idée de passage d’un type d’économie (du don) à une autre (monétarisée, marchande) pourrait être une sorte de projection de notre société contemporaine sur quelque chose qui est envisagé comme son antithèse – ce qui était, en fait, le projet de Mauss dans l’Essai sur le don, quand il parlait des sociétés « primitives » ? Et donc de localiser quelque part dans le Moyen Âge les prémisses du capitalisme ? Par ailleurs, si l’historiographie adhère largement à cette idée de passage, le moment où le situer ne fait pas consensus – vers 1050, 1150 ou 1200, plus tard encore ? – ; les époques proposées changeant en fonction de la documentation et des espaces étudiés ? 23LKL : There is probably always some element of projection in the work we do as historians. As with astronomers who look much further into the past than we do, our visions of the past are undoubtedly limited by the lenses available to us for looking at the past. That said, I certainly did not set out to construct a teleological argument meant to explain the origins of modern anything. My main concern was not economic and/or social history, but was the evolution of the Christian religion in medieval Europe. In the first instance, and for the most part, this meant concentrating largely upon the religious life, upon that tiny proportion of the population whose virtual monopoly on literacy, corporate wealth, collective memory, and mostly successful claims of self-importance gave them a disproportionately huge influence in their own time and permitted them to hand down a well-documented legacy for future generations. Religion more generally, as experienced throughout the rest of society, was a significant part of what I was after, but one that has always been relatively elusive. What drove my interest in this tale of evolution was the challenge of finding a more convincing explanation for change than a biological model of vigorous youth, powerful and influential maturity, and eventual decadence and decline. Anyone could see that fresh initiatives appeared from time to time, that some of these quickly dissipated like morning mist, while others flourished as major social movements. The charismatic innovators belonged to the tradition of the prophets, whereas those who transformed their original visions into stable institutions were of the more priestly or administrator type. The organic model worked reasonably well for purposes of description but offered no explanation for the differences between, say, Benedictines and Franciscans. Since the innovators all based their visions upon the same foundational myths, i.e., the Gospels, one key question thus became why their interpretations of these texts differed so profoundly. 24Many times in the past when I looked back at Religious Poverty I found myself increasingly dissatisfied with my treatment of the economic and social foundations of the argument for lacking in nuance, whether in regard to geographic areas, time periods, sectors of the economy, distance from major channels of communication, or still other factors. Now and then I gave serious consideration to preparing a revised edition of the book, but decided against it definitively in about 2002 when I came across a historiographical essay on Western Christian Monasticism by Bruce L. Venard. This essay appeared as an entry in the Encyclopedia of Monasticism, edited by William M. Johnston and published in 2000. Venard, by the way never a student of mine, placed Religious Poverty exactly where I think it belongs in its historiographical context, and thereby liberated me from further thoughts of needing a new edition. Moreover, when towards the end of his essay Venard sought to draw a contrast between my book and other, more recent ones, he said pointedly that what distinguished mine was that I “explicitly” asked “Why”? Better, I thought, to let the book remain a book of the ‘1970s, especially because any changes I had in mind would have had very little impact on the reader’s grasp of the central thesis. 25In spite of what I have just said, however, there is one weakness in the argument about which I was forewarned and that I should have acted on. Of the various responses to the article “Pride Goes before Avarice” (1971), one of the most thoughtful came from M. Bernard Guenée. His principal reservation arose, he said, because at the time he read it he was working on a fourteenth-century problem and he could not help noticing that in one text after another pride constituted a major moral preoccupation. He had looked for but did not find the decline in the importance of pride that my article had led him to expect. 26I do not think that M. Guenée misunderstood me. Instead, his observation made me see what I had failed to make clear. Throughout that article I meant to stress what I saw as new, and to relate what was new, in this case new in moral theology, to new developments in society and the economy. I did not mean to suggest, but neglected to point out, that what was old in any of these contexts disappeared. Then, in a broader version of the same argument in the poverty book, I was interested in relating what I saw as new in religious belief and practice to, again, new socio-economic developments. I did not see such development as governed by some variant of the law of thermodynamics, by which more avarice meant less pride, more money in circulation meant less gift exchange, or more preaching less prayer. Wherever I saw change, I was interested in the margin, sometimes very thin, of newness. So yes, old practices and beliefs obviously persisted –as many indeed still do. The mistake I made in the interval between receiving that critique and completing Religious Poverty was my failure to apply this lesson to the book. All I really needed to do was remind the reader that just as there continued to be monks in the thirteenth and later centuries, so, too, did gift-exchange behavior remain active, particularly in sustaining inter-personal relations. Indeed I came to see that in any sector a vehement defense of the status quo by conservatives can by itself be a sure indication of change. 27EM : Juste après la sortie de Religious Poverty…, vous avez publié, en 1979, dans les Annales ESC (1979), un article intitulé « La morphologie des malédictions monastiques », annonçant, en quelque sorte, le projet qui aboutit dans l’ouvrage Benedictine Maledictions : Liturgical Cursing in Romanesque France, paru en 1993, et devenu une référence obligatoire en la matière. Ce livre, vous dites en préface, est né de « la rencontre avec un moine et avec un manuscrit ». Quelle est la part du « hasard » dans les débuts et dans le développement de ce projet et, éventuellement, dans les autres projets que vous avez réalisés ? 28LKL : Chance has had a role in determining more than just the maledictions project. During one of my lengthy sojourns in Bergamo (see response to Question 4), I brought with me a massive three-volume work on confraternities by G. G. Meersseman, Ordo Fraternitatis: Confraternite e pietà dei laici nel medioevo (Rome, 1977) in order to write a review of it for Speculum. Just reading its two thousand or so pages took me several days and gave me the impression that it had described every imaginable type of lay confraternity. However, in the course of casual conversation with Sandro Buzzetti, one of the librarians with whom I had become quite friendly, he mentioned to me that they had several manuscripts there from Bergamasque confraternities. After looking at a few of them I realized, on the basis of just having read a work that appeared to exhaust the subject, that some of the Bergamo material was not only exceptionally old but also did not fit within the many typologies put forth in Meersseman’s book. It was only because I happened to work on that review in the Civic Library of Bergamo and only because that librarian mentioned those manuscripts to me that I edited some of them I found particularly interesting and thus published Liberty, Charity, Fraternity: Lay Religious Confraternities at Bergamo in the Age of the Commune in 1988. 29Turning to your question about maledictions, this, too, came about only because of a unique encounter. In 1971, an American colleague who like me was then doing research in Paris invited me to dinner. He and his wife had also invited their friend Dom Jean Becquet, whom I thus met for the first time. I was of course pleased to meet the leading expert on Etienne de Muret and the Order of Grandmont, besides enjoying his learned and spontaneously friendly company. In the course of the conversation he said that he had found something interesting that day at the Bibliothèque nationale: a liturgical formula for use by the monks of Saint-Martial of Limoges to curse their enemies. It was written into a blank folio in one of the great Bibles from that monastery. I was truly astonished and immediately felt my mind becoming flooded with questions: What did the curses say? Who were the enemies? Did the monks really use them and if so how did they justify doing so? And so on and so on. Dom Becquet’s explanation of why he found this text interesting was enlightening. Having edited the teachings of Etienne de Muret that his disciples had written down, he knew well that the holy man had instructed his followers not to do as the monks of their time did, which was to curse those who harmed them. However, Dom Becquet lacked proof of what practice that this instruction alluded to. In fact, then, what had happened that day at the BN [Bibliothèque nationale de France] was that Dom Becquet found an example of exactly what Etienne de Muret referred to. He clearly took pleasure in this discovery and because of the interest I expressed in it he offered to show it to me the next day. We did meet and read over the text and I remained fully as enthusiastic about it as I had been the evening before. At that point Dom Becquet stated that this text answered a question that had been in his mind and he was satisfied with the notes he had taken. For the rest, as far as he was concerned I was free to do with the text as I pleased. I was deeply grateful for this generous act and subsequently also for his assistance, as editor of the Revue Mabillon, with the publication of the article that you mentioned. 30EM : Vous avez mentionné le rôle de l’historiographie et des rencontres avec les historiens français, mais vous avez aussi une profonde connaissance de l’historiographie et des sources italiennes, ainsi qu’une une longue fréquentation avec l’Italie. Vous avez travaillé sur Bergame – Liberty, charity, fraternity : lay religious confraternities at Bergamo in the age of the commune, 1988 – et avez été le directeur d’une institution prestigieuse, la American Academy in Rome. Comment avez-vous été conduit à vous tourner vers l’Italie et quels enseignements tirez-vous de cette expérience ? 31LKL : There are two sets of reasons for my turning to Italy, professional and personal. I went on leave from the University of Chicago from March to December in 1965, and went to Paris to work on the translation into English of Père Chenu’s La théologie au douzième siècle. That translation occupied virtually all of my work time. However, I read far more widely in the sources cited by Chenu than was necessary just to check the accuracy of his references. It was the reading of those sources, under Chenu’s guidance as it were, that was firing up my imagination. As I did so I was shedding all doubts about being able to relate religious phenomena to social and economic history, and thus well on my way to thinking through the argument of Religious Poverty. 5 Marie-Thérèse d’Alverny (1903-1991). Giuseppe Billanovitch (1913-2000). 32As the months went by I came to realize that I was going to have to learn a great deal of Italian history, given that the most precocious area in Europe for both religious innovation and economic and social change was northern Italy, specifically in the cities of the Po Valley plain during the eleventh, twelfth, and early thirteenth centuries. I began teaching myself Italian in Paris, and decided to spend nearly two months of the autumn in northern Italy. When I mentioned my plan to Mlle d’Alverny, the chief conservator in the Department of Manuscripts of the Bibliothèque nationale and an unfailingly generous and helpful person, she replied immediately: “I will send you to Billanovitch in Milan”5. I learned quickly who this great philologist and manuscript expert was. Once in Milan I also learned quickly that he was a leading academic baron with disciples strategically placed in libraries, archives, and universities all over Italy. Besides arranging for someone to give me Italian lessons, he sent me to meet some of his disciples in such nearby cities as Pavia, Cremona, and Como. I also traveled to see Bergamo, Brescia, Vicenza, Verona, Venice, Bologna, and Turin, before returning to Paris and then Chicago. I never turned back from reading Italian sources and Italian historians. 33As for the personal reasons, I met an Italian woman briefly in 1970 in the United States, saw her a few times in Italy the following year, and we got married in 1972. By then I lived in Northampton, Massachusetts and taught at Smith College. That institution had an exceptionally generous leave and sabbatical policy. In the decades following we spent every fourth year living in Italy. In addition to those frequent sabbatical years, I was able to spend three years as director of the Smith College study abroad program in Florence. Except for those years in Florence, when we were in Italy we always stayed in Bergamo, which is where my wife grew up and still had family. Between the Civic Library in Bergamo and the university libraries in Milan, I had a good base for work. Upon occasion I would go to Paris for a few days or to Rome to work in the Vatican. During much of that period André Vauchez, whom I knew from the seminars of M. Michel Mollat and M. Le Goff, was Directeur d’études médiévales at the École française. Besides getting me one of those passes allowing me to enter the library of the École during the endless mid-day closure, critically important because back then the Vatican Library closed for the day at 13:30, André introduced me into the Circolo mediovistico romano, where I met many colleagues, including a large number of Italians of course, but people from so many other countries as well. The meetings of the Circolo, held often at the École but at some of the other foreign academies, too, were important enough to me that I planned some of my trips to Rome around them when I could. It is ironic in the extreme that one of the foreign institutes that I never set foot in or met anyone from or talked with anyone about was the American Academy in Rome. I had absorbed, I don’t know how, a vague image of a place that was reserved exclusively for classicists and artists. Thus even though I knew from many points of view including direct experience that Rome was an excellent place for doing research in medieval history, I never even inquired about seeking a fellowship at the American Academy. 34It was only in 1991 in a casual meeting with the then director of the American Academy that my mistaken notions about that place got corrected. I visited the Academy briefly in the following year, and three years later his successor invited me to spend four months there as a resident scholar. That was when I really came to know the wonders of living and working in Rome. In 1998 a friend convinced me to apply for the directorship; I was offered the job; and so my wife and I went off to Rome for three years, and ended up staying for seven. 35Italian historiography is, as we all well know, focused very much on individual cities. Just as striking to me, furthermore, is the overwhelming importance of Italy’s notarial culture, which has recorded transactions in that country for so many centuries. The archives are filled with mountains of archival material. Students get thorough training by working on very precise, carefully limited subjects. The combination of such training with the urban focus, which carries over into the careers of many fine Italian historians, has I think favored foreign scholars by leaving relatively open the history of the countryside or the histories of whole regions (Pierre Toubert, François Menant come to mind), and comparative histories of topics that involve many cities (Philip Jones, Diana Webb) or comparative topics that involve Italian with other European matters (David Abulafia, Robert Brentano). Even in a single, short paragraph about medieval Italian historiography such as this, one cannot fail to mention the weighty presence of the Roman Church. Italian historians are clearly the masters of church history, although the reverse side of that may be, no matter what their political and religious inclinations, that they tend not to deal much with religion, i.e., not to disengage religious sentiment and behavior from the institution. 36Finally, I should add a few words about my own recent attempt at writing a piece of Italian history. By the fortunate accident of finding myself frequently in Bergamo, I long ago became curious about a local, thirteenth-century saint, Alberto by name, now no longer venerated or even known outside the village where he was born up in the mountains north of the city. Over the years I occasionally tried to find out a bit more about him, but all I could find out was his legend, which consisted of pious behavior and miracles, and that once a saint he became the patron of wine carriers or wine porters. This métier is even less known today than the saint; the very word for one of them in Italian is obsolete: brentatore, or in Latin brentator. But when I finally focused my attention on both parts of this unpromising subject, it expanded. I have worked in the archives of twenty-two northern Italian cities and reconstructed this lost métier and located the cult in eight cities. One day when I was in the state archives in Vicenza and talking with two archivists, I asked whether they had a certain type of document. The more senior of the two said they did not but was curious to know why I had asked. I explained that I had worked already in some fifteen different cities and found such documents in about half of them. She turned to her colleague to say in a perfectly agreeable way: “You see how they do it?” I assume that by they she meant either outsiders (forestieri) or foreigners (stranieri). In any case, the book should come out within about a year. 37EM : À propos, justement, de vos derniers travaux et de vos projets en cours, à Rome, vous avez organisé en 2001 une rencontre interdisciplinaire sur un sujet peu traité jusqu’alors, les épidémies des vie-viiie siècles, ce qui a donné lieu à un ouvrage collectif paru en 2007 : Plague and the End of Antiquity : the Pandemic of 541-750. Pourriez-vous nous parler des prolongements de ce travail et de vos autres programmes actuels ? 38LKL : My reply has once again to take us back to the work of Jacques Le Goff, specifically to the article that he published jointly with Jean-Noël Biraben in the Annales ESC in 1969: “La Peste dans le haut Moyen Âge”. It became the first chapter of the latter’s important book, Les hommes et la peste (1975). Theirs was a fruitful collaboration because it brought together Biraben’s expertise on plague with Le Goff’s incomparable capacity to bring forth ideas and hypotheses. I had no training whatever in Byzantine history and only a quite weak training in the history of the West in the early Middle Ages, but even so, never had I heard or read any mention of this more than two centuries’ long pandemic of plague. I checked several standard works on the period and found not one that mentioned plague, and yet the article listed the sources, so they were there for any who wished to see. 39In the 1970s and 1980s my teaching program included a general introductory course on the Latin West in the early Middle Ages, c. 500-1000, which I offered every other year in alternation with a similar course on the period from 1000 to 1300. The reading list for the former always included Gregory of Tours, Paul the Deacon, and Bede, and I always made a point of discussing their passages on plague in class. But aside from reading also the famous passage in Procopius and the four or five articles that had been written on this pandemic, I merely kept a folder and placed in it references to the subject that I occasionally found. Only in the 1990s did I start to read more extensively in the subject, and that was because I wished to see whether the earlier plague pandemic produced some of the same reactions as we see between the fourteenth and eighteenth centuries, reactions such as the intensification of piety or instead a turn to hedonism, abandonment of traditional funeral and burial rites, a considerable rise in the value of labor, and so on. Encouraged by what I found, I offered my seminar for about four years on a comparative history of the Justinianic Plague with the Black Death. I found it useful to ask of the sources for the earlier pandemic some of the questions that scholars had asked of those for the later one. Although I learned much from that seminar, I had no plans for going further. Whereas it was perfectly clear that what was needed was a book, very broad in scope but not necessarily long, that covered the entire history of what we know about the earlier pandemic, and even though I was tempted to do it myself, I knew I could not do it because I lacked the language skills to use all the relevant sources. 40My musings about this matter were interrupted by my appointment to the directorship of the American Academy in Rome. I knew that my responsibilities precluded doing much research or writing but what I found relatively easy was the organizing of conferences. The obvious solution to my dilemma was to gather a group of scholars who together could cover all the languages in which the most important sources were found. To get the right people and make a worthwhile plan for a conference and a subsequent book, I invited four persons to Rome for a few days of discussion. It was an immensely useful meeting, as it gave me a good sense of the issues that needed to be addressed and of the leading experts on plague in the cultures and languages of the Mediterranean basin. I asked whether we might need to address the controversy then raging about what disease the Black Death really was. The answer given by the person in our group with the most knowledge of medicine was that plague attacks the flesh, it kills –if it does– very fast, it thus leaves no traces on the skeletal remains, and therefore “we shall never know the answer”. It is worth noting that what he was suggesting without actually saying so was that the persons on both sides of the Black Death controversy, even if some were scientists, had only the usual written historical sources upon which to base their arguments. We could never know because people could continue to argue over the interpretation of texts forever, whereas there was no possibility of getting definitive medical proof. Shortly after that planning meeting, which took place in the spring of 1999, I received a message from the Byzantinist who had attended it, the late Evelyne Patlagean, telling me of the publication by a group of molecular biologists at Marseilles of their identification of the plague pathogen in remains from the 1720s and the 1590s. My immediate reaction was that we needed to have one of those biologists at our conference and that we would indeed sooner or later get an answer about the disease, produced not by historians but by paleopathologists. 41The conference took place in 2001. The fifteen participants included experts on plague in Latin, Greek, Old Syriac, and Arabic sources. In addition, there was an archeologist who had done work on demographic decline in the sixth and seventh centuries, and the leader of the Marseilles group, Michel Drancourt, who in 2000 had published another study that pushed their findings of plague DNA in remains from as far back as the fourteenth century. And finally there was Robert Sallares, an English classicist retrained in biology, who in 2000 made the first positive identification of malaria DNA from the remote past, specifically a fifth-century A.D. site just north of Rome. Without having need of a formal oath-taking, we all came away determined never again to engage in discussing such a subject as an epidemic without having the participation of both historical and biological expertise present. The conference papers appeared, as you know, in Plague and the End of Antiquity (Cambridge, 2007). 42While directing my energies thereafter to the project concerning Italian wine porters and their patron saint, I kept myself informed about the developments in plague paleopathology, which in fact were coming out of several European laboratories in what looked like a fiercely competitive (and occasionally hostile) race. In 2009 I had an opportunity to improve my modest knowledge of bio-medicine by teaching a course in a special interdisciplinary program at Dartmouth College. I chose to devote it to the history and biology of plague, and was fortunate in having the collaboration of two specialists in infective diseases from the Dartmouth Medical School. In late 2010 there appeared, with considerable fanfare in the press, a report from a large international group that had recovered plague DNA from several European sites. Ever since the first Marseilles report the Black Death plague-deniers had continued to resist, but I felt that this new report of 2010 signaled the arrival of scientific consensus and end of that controversy. I got to work on an article in which I attempted to explain to my fellow historians what had happened in the previous decade and why it was important for all fields of history. I called it “Plague Historians in Lab Coats” and it was published in Past and Present, in late 2011. I continue to read about developments in the field but have no specific plans about another publication at present. 43EM : En parcourant vos travaux, vos articles, vos nombreuses recensions, le lecteur se rend compte de votre souci historiographique, du rôle de « passeur » entre différentes « écoles » et courants que vous avez pu jouer, aidant à briser, dans la médiévistique états-unienne, le monopole de l’histoire méthodique que vous décrivez, au profit d’un décloisonnement disciplinaire. Aux États-Unis, vous avez été un collaborateur assidu des revues comme Speculum ou The American Historical Review, de même que The Journal of Interdisciplinary History et Journal of Social History. Vous avez aussi codirigé, avec Barbara H. Rosenwein, un volume de mise au point historiographique : Debating the Middle Ages : issues and readings (1998). Dans le contexte international des études médiévales, que pensez-vous de l’apport et de l’état actuel de la recherche en histoire du Moyen Âge aux Etats-Unis ? 44LKL : What you say very kindly in your question has not always been seen that way by some of my colleagues, those who have regarded me as, in terms of the cliché, “a jack of all trades, and master of none”. One colleague once told me: “You always choose interesting subjects”, which he did not mean as a compliment. It is certainly true that there is considerable variety in the subjects I have chosen. But as I indicated earlier, I have never been interested in becoming an, let alone the, expert on a given subject. The risk has thus been that with each new subject I am a beginner, an amateur. To do the maledictions book I had to enter the arcane world of liturgy, one dominated –for good reason– by clerics. Since the minor saint I have been working on recently was sainted both in the old-fashioned way by communal consensus in the thirteenth century and another time by the papacy under its post-Tridentine procedures in the eighteenth, I had to study the history of canonization, besides much else, in order to figure out the politics in each of these two totally different situations. I enjoyed doing so tremendously, but I recognize that I always chose not, as another cliché puts it, “to learn more and more about less and less”, but to try to solve problems that I found challenging, where the challenge involved finding whatever method would help me find a solution. What has been consistent in all of my work, except in the plague conference and book where my role was mainly that of organizer and then editor, is that the problems I have dealt with have all had to do with the social history of religion. 45In the past fifteen years it has become increasingly difficult for me to make general observations about historiography. Barbara Rosenwein and I had just completed the book you refer to in 1998 when I started the directorship in Rome. With my new responsibilities I had to change my usual routine radically, which meant in regard to this particular context not keeping up with journals, not reading many new books in the field, and not attending most of the meetings I usually went to. Of course I had planned to go away for only three years but when that stretched to seven I fell seriously behind. Since becoming free to return once more to scholarship, I have never returned to trying to keep up with my field as I once had but have limited myself instead to reading whatever I find useful for the work I have at hand. 46Still, after that lengthy disclaimer, I can state a few anecdotal observations. One is the crucial breakthrough of Iberian history in the past two or three decades in the United States. Teofilo Ruiz at UCLA was one of the first of the specialists in medieval Spain who have by now gained professorships in several of the leading research universities, and are thus well positioned to train students in that field. Similarly flourishing is the field of Islamic history, in part an important response to the wake-up call 9/11. In this connection, in one institution after another, the old courses on the crusades are out, replaced by courses on crusade and jihad. I think it noteworthy that virtually all the American colleagues that I can think of are very much in contact with colleagues in Europe, so globalization or at least its trans-Atlantic subsection has come to medieval history. There are some matters I have become aware of in connection with my work on plague, for example the initiative of Michael McCormick in starting the “Science of the Human Past Program” at Harvard, which does indeed integrate the work of laboratory scientists in the process of solving historical issues. Similarly I find very impressive and promising the work of climatologists at Columbia and Belfast and many, many other places. The extraordinary efforts of environmental historians who unlock the secrets long encased in ice or in tree rings are giving us essential insight into the history of food production and hence population, both human and animal. Among several other promising signs of innovation I will mention just two. One is the call of Dan Smail of Harvard for historians to reclaim « the deep history of humanity », essentially the time period called « prehistory » during which our ancestors, even if nameless, left us much evidence of the lives they lived6. The other is the work of an international team of geneticists, archaeologists, physical anthropologists, and historians assembled by Patrick Geary of the Institute for Advanced Study. By means of genetic analysis they intend to elucidate the migrations of people who moved from Pannonia into Italy in the second half of the sixth century and thereby cast new light on the migration period. 47There is one area at least in which American medievalists have failed that I wish to mention, namely communicating with the reading public at large. Of course that public is very different from its counterpart in European countries, but still it is a source of regret that we lack colleagues who are first-rate scholars who at the same time have been able to write really engagingly for a large, reasonably well-educated audience. The two historical eras for which American readers hunger inexhaustibly are those of the Tudor and Stuart monarchs and of the American Civil War. Our European Middle Ages just cannot get on the same bookshelf with these perennial favorites. The occasional medieval best-sellers, and here I mean attempts at history, not historical novels, tend to be seriously misunderstood and over-simplified versions of material found in a few secondary works; the very title of one such successful book should warn an educated reader: How the Irish Saved Civilization. The book’s subtitle is worse still: The Untold Story of Ireland’s Heroic Role from the Fall of Rome to the Rise of Medieval Europe. Surely we should be able to do better. 48EM : Vous avez fait la plus grande partie de votre carrière aux États-Unis, au Smith College, à Northampton, Massachusetts. Que retenez-vous aujourd’hui de votre expérience d’enseignant et de pédagogue, du rapport avec les jeunes apprentis historiens, de la vie universitaire ? 49LKL : Yes, thirty-three years on the faculty at Smith, before that eight at the University of Chicago, and before that two at Princeton. Interspersed in these forty-three years were terms or years on leave plus terms as a visiting professor, once each at Venice and Yale and twice at Berkeley. What I have to say about my teaching experience ties in well with what I was saying about specialization in my answer to the previous question. Early on it became clear that I was better suited for teaching undergraduate rather than graduate students. Stated simply, I did it better and derived greater satisfaction from it. To be sure, there is an imagined –and I suppose real– hierarchy of prestige in American academic life. Professorships in universities tend to be more highly regarded and better paying than those in undergraduate colleges. Since every university has an undergraduate college within it, most university professors regularly teach both undergraduates and graduates. Advancement in one’s career in the leading purely undergraduate institutions requires excellence in scholarship but usually also requires excellence in teaching, whereas in some universities the teaching component may be given less importance. Non-Americans need to be reminded, though, that there is no such thing as a national system of higher education so there is considerable variation in the criteria for academic promotions in the United States. 50The implication of this preference for being in an undergraduate college, which usually means teaching in a relatively small department, is that one cannot specialize nearly to the extent that one can in a large department in a large institution. Smith has 2,700 (all-female) students, departments in all of the humanities, all of the social sciences, and all of the sciences, and a faculty of about 240 professors. The History Department had about fifteen members during most of my tenure, so I was the lone medieval historian, inserted in between our ancient historian and our early modern (or Renaissance and Reformation) European historian. We had to teach three different courses per semester or six each year when I started at Smith, but half-way through my time that was reduced to two courses per semester. Therefore just in order to be able to teach several different courses my reading had necessarily to be spread out over most if not all of the geographical areas, topics, etc., encompassed in the broad range of medieval history. On the other hand in a large university history faculty, with perhaps three or four medievalists, an individual is far more likely to specialize. Nothing of this experience is unique to me. 51My classes usually had between about fifteen and twenty-five students, and seminars about six. Obviously I came to know each student quite well. It was, and remains today, a very luxurious –some might say inefficient– system of education. It means a great deal of time spent in dialogue and great effort as well as much time spent in criticizing drafts of students’ papers and individual research projects. 52In these four decades we have of course witnessed, just as others elsewhere have, a decline in the number of students possessing knowledge of Latin. For those who do become seriously interested in medieval history, particularly if they wish to go on to a graduate school, they must either be proficient in Latin or work at becoming so. Some colleagues used to lament that this situation signaled the end of “our” civilization, and yet already several years ago Dom Jean Leclercq was very optimistic about this matter. He marveled at how Japanese history was flourishing in the States and how most of those studying it had had to start learning the language when they were no longer adolescents; he stressed that what explained their success was the their mature motivation and that the same was happening already with those who wished to study the Middle Ages. What Dom Jean was so perceptive back then has now become the usual state of affairs. 53I think the profound concern on the part of some young people about the fate of the planet is driving some of the interest in environmental history. And just as with having to learn Latin or paleography in order to accomplish what one sets out to do, if they have to improve upon what they learned in secondary school in, say, chemistry or biology, if they are really committed they will have the necessary motivation. Still, there are limits to how many skills a person can reasonably be expected to know, which is where collaborative research comes in. Already in the plague course I taught at Dartmouth I had some of the history students work on topics together with the biology students. Such collaboration has become more and more the norm for our students, so this along with the other developments mentioned above make me feel very optimistic about the health of our discipline in the coming years. 54Finally, while I have been very fortunate to have a considerable amount of time on leave for doing research and writing, I was always happy to return to teach. In fact it was during those times when on leave that I took time to think through what I might do to improve my teaching, whether the actual content of the courses or the manner in which I presented it to the students. However well or poorly I did my job, the major part of my energy and enthusiasm came from my interaction with those “young apprentice historians” as you so nicely call them. 1 M.-D. Chenu, Nature, man, and society in the 12th century: essays on new theological perspectives in the Latin West, With a preface by Etienne Gilson; Selected, edited and translated by Jerome Taylor and Lester K. Little, Chicago/London, 1968. 2 J. Le Goff, Marchands et banquiers au Moyen Âge, Paris, 1956 ; Id., Les intellectuels au Moyen Âge, Paris, 1957 ; Id., La Civilisation de l’Occident médiéval, Paris, 1962. 3 M. W. Bloomfield, The seven Deadly Sins. An introduction to the history of a religious concept, with a special reference to medieval English literature, East Lansing, 1952; A. Katzenellenbogen, Allegories of the Virtues and Vices in Medieval Art from Early Christian Times to the Thirteenth Century, London, 1939. 4 L. K. Little, Pobreza voluntaria y economía de beneficio en la Europa medieval, trad. Mercedes Barat, Madrid, 1983. 6 D. Smail, « In the Grip of Sacred History », The American Historical Review, 110 (2005), p. 1337-1361.